probably a dozen different placements/changes so far. I tried moving the existing cable, and couldn’t eliminate the buzz. I think the existing cable is quite poorly screened, and picks up interference from the yoke magnets. Also the existing amplifier is on the same PCB as all the power electronics that drives the yoke magnets,. I completely replaced the existing cable with some higher quality screened audio cable that has a metal foil screen (I think it is made by Van Damme), and also replaced the existing amp with a separate amplifier module. Having done this it seems to be pretty much immune to interference, and the placement of the cable doesn’t seem that critical now. I don’t think moving the cable alone would be enough. Replacing it with a better quality cable would probably help. I can highly recommend the method described above with the power amplifier board, it was cheap and easy to do and the results are amazing! If I remember rightly, on mine the original audio cable was only grounded at the power board (where it connects to the original amp), so when that connector is disconnected from the power board, there was no ground screening of the cable at all. My new cable is grounded at both ends, and runs fairly flat to the PC. I’ve also twisted the power and ground cables together. It doesn’t seem to pick up any interference, regardless of where you put the cable now. I mean to say, I don’t remember hearing anything at all when I move it around. If you are still having issues, you could try running the audio cable under the PCB also. My bet is that using a better audio cable grounded at both ends will probably fix your issue. power board and the new cables/amp. Likewise, all I could hear after the mod is the very faint noise from the neck coils (i.e. “coil noise”) but silence on the audio. Perfect! Thanks for publishing this, I have ordered the parts and will be attempting it on my noisiest Vectrex. There is, like you say, an argument to be said that the buzz has some historical interest though. Could you please give some advice on the best way to install a switch to allow a user to flip between the old amp and the new? Excuse the delay in reply, I’ve been travelling and just got back. However, if you do want to be able to switch between the amplifiers, one option would be to use a “double pole double throw” (DPDT) switch to allow the speaker to be switched between the two amplifier outputs. My thinking is that switching the output side (rather than the input) would avoid the risk of introducing noise at the input side of the new amplifier. The switch would be connected so that in one position, both speaker wires are connected to the new amplifier, and in the other position both speaker wires would be connected to the old amplifier. Hope this helps, but let me know if you have any questions! I think I’m going to give this a shot. I performed the shielded cable mod by itself but it didn’t seem to make much difference. Would it be possible to add a picture of exactly where you pulled the 5v and ground? Also, did you leave the original amp in place? Likewise, I found that shielded cable alone was not enough to eliminate the buzz, and that’s why I moved the amp. 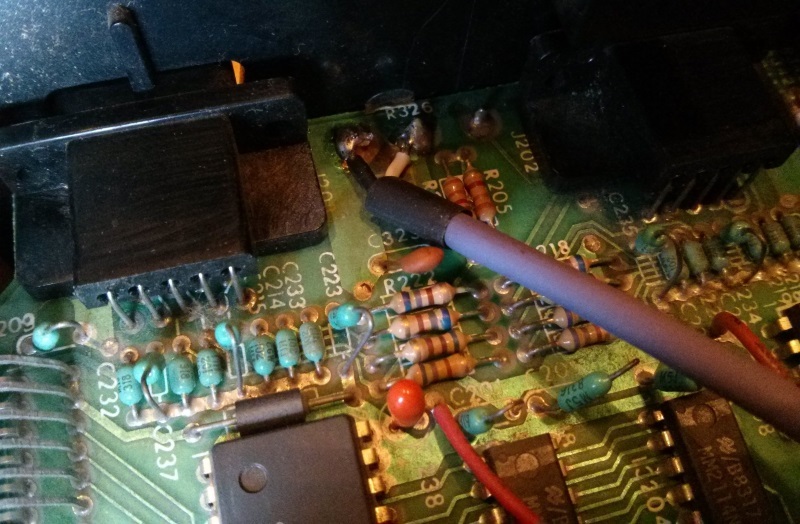 I don’t have a photo of the 5V/GND connection, but could take my Vectrex apart again to get one… no promises, but I may find time this weekend. 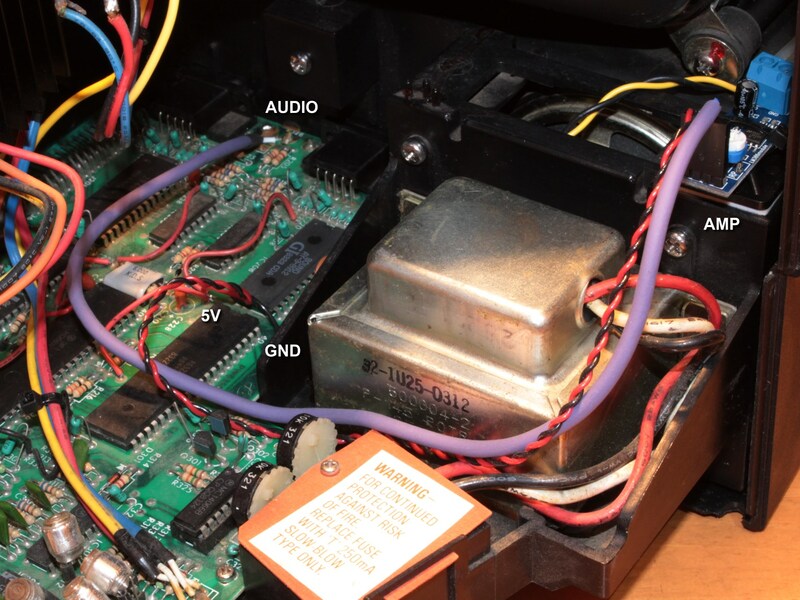 The original amp components are still in place, but there are no audio or speaker connections to the old amp (they are connected to the new amp). Reinstating the old amp would just be a matter of swapping some connectors over. I finally had a chance to install a cap kit and the audio mod. I pulled the 5v and ground from the solder side of the logic board from a couple unused through holes near the volume pot. No more buzz! I did notice that the volume doesn’t go quite as high as stock, I’m guessing from using 5v instead of 9v. My next attempt might be using 9v if the wire routing required isn’t too crazy. Thanks for the idea and details! Hi Tom, I’m glad you managed to fix the buzz! The volume is indeed reduced because of the 5V supply, but I decided it was plenty loud enough for me! From memory, I think the 9V supply is on the neck board, so it might mean running some longer cables to bring that to the amplifier. If you decide to do that, I would try running both ground and 9V and twisting them together, to hopefully avoid picking up noise. james, could you explain the solder points you used a little more detailed please? and which parts did you removed from original circuitry exactly? The audio cable is soldered to two pins of the volume control (R326) as pictured above, and the other end goes to the new LM386 module (the old audio cable ran from EP107/EP108 to connector J302). The existing speaker connector P103 is disconnected from the existing PCB jumper J103, then connected to the output of the new LM386 amplifier module instead. To power the new amplifier, I soldered two wires, one Black wire to the GND plane (easy to find) and Red one to one of the 5V supply lines. There are lots of places you can find 5V on the logic board, and the easiest way is to examine the Vectrex circuit diagram. 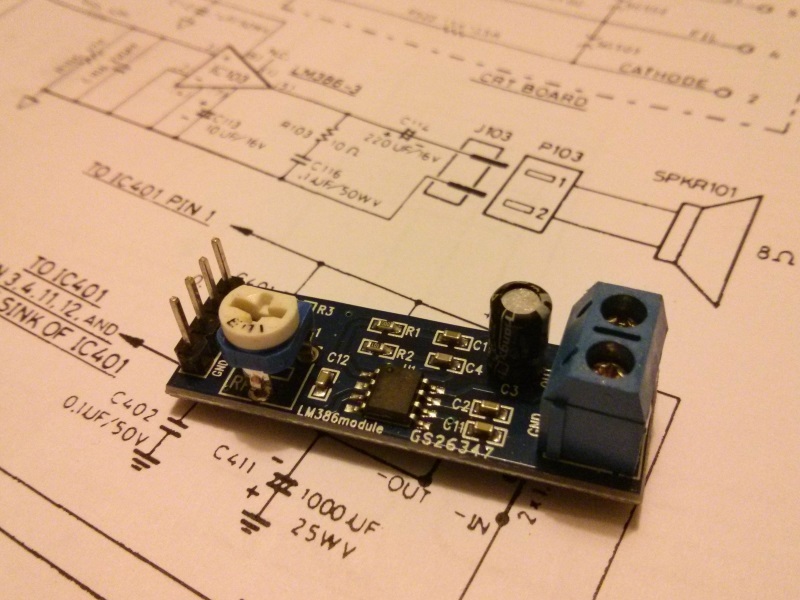 What you need is the “+5V DIG” power rail. This originates from J204/P204, and runs all over the logic board. Many of the ICs on the logic board have their VCC pin connected to +5V DIG, so you just need to locate a convenient point on the PCB where you can access one of the tracks carrying +5V. You can double-check by switching off all power completely, then use a multimeter to test for continuity between +5V on J204 and the point you plan to draw the +5V from (this is a bit safer than probing around the PCB with a meter when it is powered on). From what I remember, I found a track carrying +5V somewhere on the top side of the PCB nearby the AY3-8192 chip. The best place to look is in the Vectrex Service Manual which has circuit diagrams (schematics) for the logic board. Just wanted to Thank You for your Buzz Fix! I just added it to my recently acquired non-working Vectrex, which I restored, and the Fix works like a charm! To others who wish to try your mod, some of the eBay sellers of this LM386 amp board have ad pictures of boards that look the same as the one in the mod, but actually ship different boards. I had this experience with one seller, the board did not have the variable resistor or the large electrolytic and had R1 but no C1. This board did not work properly, too much gain with and without R1. I was successful with another seller in gettting a board identical to the one pictured. I grounded both ends of the audio cable attached to the recommended pot terminals and found that its routing wasn’t critical. I don’t hear any buzz from the speaker. My audio cable was from a fairly thick salvaged audiophile cable with double shields, foil and two internal wires. I was too lazy to hunt for +5V from on the logic board, I spliced into the +5V wire in the bundle that snap-connects to the logic board (i.e. plug P204 that connects to jack J204 on the LB). Trace the wires from this plug back to the Power Board and the circuit board is labeled for each wire. Last, I had to give my on/off volume control pot a good cleaning with contact cleaner. Thank You for the knowledge and inspiration!!!! Great – I’m really glad to hear this helped! Thanks for the additional information above, I’m sure that will be a big help to others attempting this mod. Many thanks! I have done the first mod from console5 before with the opamp circuit then I switched to this one. Should I remove the opamp circuit ? I think the console5 mod is a pre-amplifier, which boosts the signal. It’s possible this might then be too high a level and you could get distortion (clipping) in this case, so you might need to remove the pre-amp (in any event, the pre-amp isn’t really needed with this LM386 mod). First thing to check though: did you remove R1 from the LM386 module? The LM386 module I bought had the gain set to 200, so I removed R1 to reduce the gain to 20 (same as the Vectrex). If yours is still set to 200, this could also cause distortion. The 5V supply versus 9V supply just results in reduced volume. Distortion is usually due to the input signal or gain being too high (so the signal gets “clipped”). Hope this helps! Basically, the gain of the LM386 module is 20, if your input voltage level multiplied by 20 exceeds the supply voltage to the LM386, you will get “clipping” (which means sounds will be distorted, because sine waves get “squared off”). 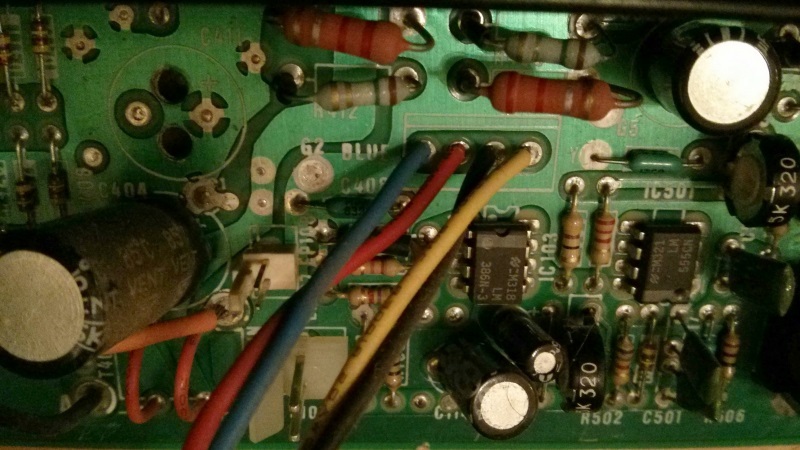 Using the pre-amp doesn’t compensate for the 5V vs 9V issue (i.e. although the pre-amp does increase the volume, it risks causing distortion because the output voltage is limited by the supply voltage). If you have access to an oscilloscope, it would be fairly easy to check for this. To prevent clipping you could either 1) remove the pre-amp, 2) bypass the pre-amp, 3) increase the supply voltage to the LM386 to 9V, 4) reduce the gain of the LM386 further. You mean I remove the cable that goes from audio connector on the logic board, then use a cable between preamp input to lm386 input ? sounds better to me to get rid of that preamp if it’s useless, maybe I shouldn’t be afraid to revert back now. 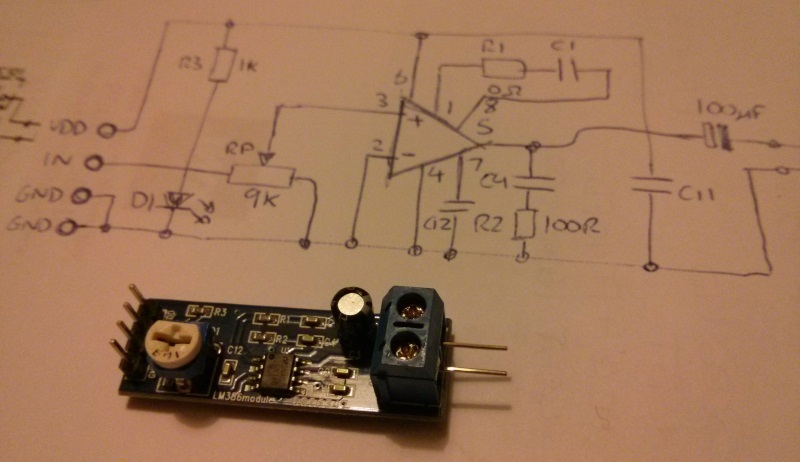 What about using a voltage regulator to turn 5V to 9V to avoid getting noise from the power board ? I also have one interrogation, when I try to link the ground from the LM386 to the logic board I always get lots of noise, so I didn’t connect this at all. What is going bad ? Is there a specific place to connect GND and avoir noise ? Same for +5v, I use the point on the wiki for the preamp…. Not easy to see where it points on the pictures of your tutorial. Hi James. Just removed the preamp and sounds better now, less distorted. Next step would be adding a 9v voltage regulator. Great, I’m glad that cleared it up! The good news is that you don’t need to add another voltage regulator, you could use the existing +9V unregulated supply from the main power board. Actually, thinking about it…. the input voltage level to the amplifier is the same, and the amplifier gain is the same, so the output voltage from the amplifier will be the same, hence the volume will be the same. As long as the supply voltage is high enough to avoid clipping, it probably won’t make any difference. that’s what I was thinking, sound fine enough to me and satisfied with the mod… however I have some volume drops from time to time, sometime sound just disappears for 1 second or less, then comes back with more volume, had this on 5V and 12V, have you ever noticed something like this ? This is not something I’ve ever seen myself. My best guess is that it could be a bad solder joint or poor connection of some kind, resulting in an intermittent electrical connection. 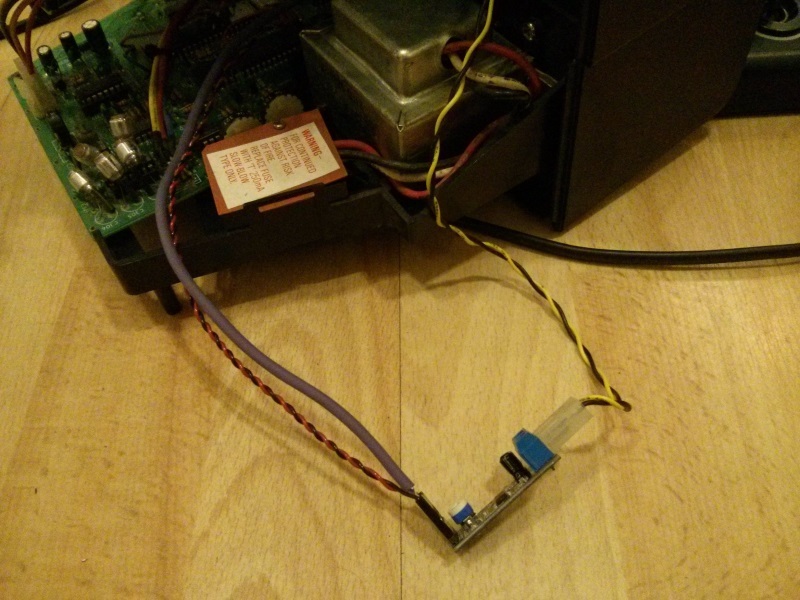 It’s also possible it could be the volume potentiometer (if that is worn/dirty/damaged). have you ever thought about a mini jack out mod ?